Garden Media Group continues to shine on camera in 2016. The 2016 Garden Trends Report, “Synching with Nature,” identifies eight new trends that help consumers – and their smart phones – get outside. This year is all about connecting, and the gardening industry is no exception. This year, consumers merge technology with nature and use it to learn about the outdoors, explore and entertain. 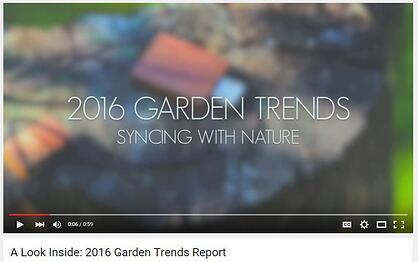 A new trends video will post every month and on social outlets using #LightsCameraGarden and #GardenTrends. Subscribe to our channel for updates!